She's beautiful! Love the sparkle. Thanks for joining us at Sunny Day Crafting. Lovely card, love the sparkle! Thank you for joining our challenge at Crafting With Friends! 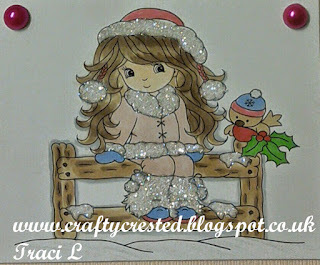 Gorgeous card......Thanks for playing along with us at Fab'n'Funky this week. Lovely. Thanks for joining us at Fab'n'Funky challenges. such a cute card! Thanks for playing along in the Artistic Inspirations Challenge.